Each time a new version of WordPress rolls out, we’re all excited about getting to play with its new features. However, few versions in the past have garnered as much buzz around them as WordPress 5.0 because of these two simple words; Gutenberg Editor. Gutenberg is a complete redesign and re-imagination of the WordPress editor; with this, the default way that people create content with WordPress will radically change. Big changes to your favourite platform can be difficult to accept. However, even massively popular platforms such as WordPress need to adapt to the times, or risk losing market share. Gutenberg is a bold leap forward, and it’s not the only update that’s coming up. If you’ve been using WordPress for a while, then you’ll know how much the platform has changed over time. Even individual updates often bring significant shifts. For example, the 4.9 ‘Tipton’ update enabled users to schedule design changes in the WordPress Customiser so they can go live at later dates, just like post drafts. A list of nearby WordPress events. We’ll see some improvements to the WordPress Rest API. The WordPress Rest API helps developers create more feature-rich products by making it easier to send and pull data from your website. This update means developers will be able to more easily create applications using the platform as a framework. You can expect a lot of activity for a few weeks, as everyone learns to contend with the new editor. Aside from your own editing experience, Gutenberg will also bring important changes to a lot of your favourite plugins and themes. For example, we’ll probably see the emergence of a lot of Gutenberg-friendly themes, which will be designed to take advantage of all the new features the editor offers. Similarly, you’ll see changes with some of your favourite plugins. A lot of plugins interact with the WordPress editor directly, whether that’s to add new functionality or include shortcodes. Those plugins will need to become Gutenberg compatible, unless they want to alienate a large part of their user base. Years from now, it might even be common to find plugins that only support Gutenberg. As of today (6th December), you can update your WordPress to 5.0. 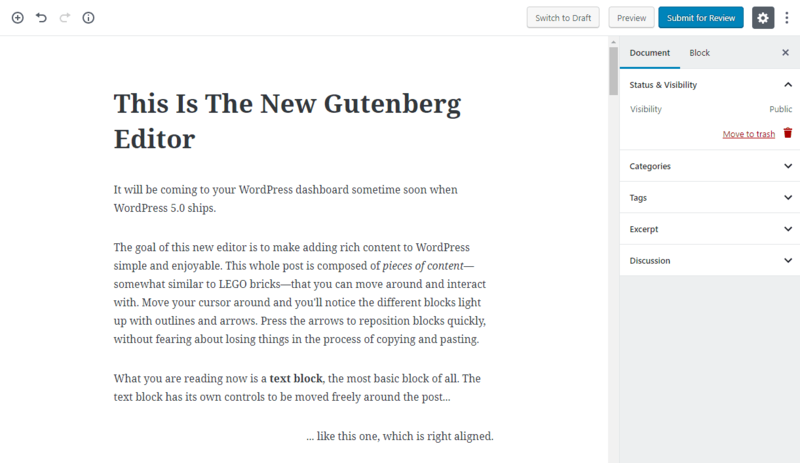 Do you plan on making the switch to Gutenberg, or sticking with the classic WordPress editor? Share your reasons with us in the comments section below!